A bio from his son Fillmore. Bill was an acquaintance of mine through a disability and media listserve. My sympathies to his family and all those who loved and cared about him. Here's a tribute to him from disability rights attorney Lainey Feingold. William Baldridge Loughborough, Jr. died April 7, in Madrid, Spain. He was born January 3, 1926 in San Antonio, Texas, to William Baldridge Loughborough and Catherine Ellen Van Houten. He had two older sisters, Julia and Ellen. One of his formative childhood experiences was being taken to see Duke Ellington at the Majestic Theater in San Antonio with his sister Julia. The show was a “colored only” performance, and Bill and Julia were snuck in by Arabelle Brown, the family’s live-in maid. This was the beginning of Bill’s lifelong love affair with jazz. As a boy, he met David “Buck” Wheat, who would become his best friend and longtime musical collaborator. He attended the Georgia Military Academy from 1937 to 1942, then the Massachusetts Institute of Technology. At 16 he was one of the youngest freshmen then at MIT. He left MIT to become a musician in New York City, where he lived until he joined the U.S. Navy in 1944. He served his tour of duty as a radioman stationed in Norfolk, VA. He returned to San Antonio in 1949, where he managed a semi-professional baseball team, and umpired local baseball games; he moved to San Francisco in 1951, where he continued to work as an umpire. From 1954 to 1955, he and David Wheat helped build instruments for Harry Partch, including the “Marimba Eroica” a marimba which could achieve barely audible notes; below the lowest notes on a piano. Bill and Buckwheat were inspired by Harry Partch to create their own instrument, the “Boo Bams,” tuned bongos made from hollow bamboo logs which Buckwheat brought back from the Philippines. Several jazz groups used Boo- bams in their recordings, including Chet Baker, with whom who Bill toured and recorded. In addition to building musical instruments, he and Buck wrote songs together; Bill wrote lyrics while Buck wrote music. Their best-known composition, Better Than Anything, has become a standard, recorded and performed by too many to count. The best known artist to record the song was Natalie Cole, who recorded it as a duet with Diana Krall on her 2002 album, Ask a Woman Who Knows. The album was nominated for several Grammys, including Best Pop Collaboration with Vocals for Better Than Anything. Beginning in 1957, Bill and Henry Jacobs, who he’d met in Chicago, started a recording studio, which released a recording of Alan Watts reading Haiku, as well as other esoteric recordings. He and Henry worked together with many other musicians and engineers on the Vortex project, sponsored by Berkeley radio station KPFA and the California Academy of Sciences. The music created by the project was played at shows at the Morrison Planetarium in San Francisco. Henry Jacobs was friends with Garry Goodrow, an actor with a new improvisational theater troupe called the Committee. Bill was fascinated by the Committee’s satirical-political focus, and asked to be Committee founder Alan Myerson’s apprentice. Eventually he became General Manager, and his involvement with the Committee lasted for about 7 years. At the height of its success, the Committee performed in two theaters in San Francisco as well as one in Los Angeles. Bill started working at University of California Medical Center as an Electronics Engineer in the early 1960s, which eventually led to work with the Smith-Kettlewell Eye Research Institute in the 1970s. He worked for Smith-Kettlewell for well over thirty years, making many contributions to the world of vision science and rehabilitation. Some of his achievements are listed below. • He worked on early experimental tactile vision substitution systems, building the first large scale mechanical stimulator array. • He developed the Smith-Kettlewell Light Probe, a compact, miniature light sensing device with auditory output that enabled blind people to detect the presence and intensity of light. The device had an active mode that reflected infrared light off a nearby surface, enabling the user to detect the reflectance of any point on a surface, assisting in such tasks as identifying paper money bills or locating the signature line on a check. Many thousands have been produced and sold. • He developed the Talking Signs orientation and navigation system for blind and visually impaired pedestrians. This is a system of coded infrared transmitters placed at locations of signs or landmarks in the environment, whose signals are decoded into speech by a hand-held receiver carried by the blind user. He was also instrumental in commercializing the system. • He developed an intuitive and simple to use touch-screen based talking computer access system for blind users. When the user touched any point on the screen, the information displayed at that location would be read out in synthetic speech. This system formed the basis of a commercial computer access system marketed by a major manufacturer. • In later years he became extremely active in efforts to make the World Wide Web more accessible to blind and visually impaired users. He served actively on several working groups of the Web Access Initiative (WAI), contributing to guidelines for web authoring software and general web accessibility. 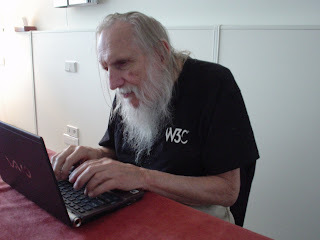 Judy Brewer, director of WAI, said this about Bill: "The Web Accessibility Initiative mourns the passing of William Loughborough, a tireless advocate for accessibility since before the beginning of WAI. Over the years William contributed energetically and enthusiastically across all areas of WAI's work, from raising awareness to helping ensure a technical foundation that supports accessibility, never hesitating to ask questions and exhort those around him to make the Web truly accessible for people with disabilities. William constantly challenged stereotypes of older Web users as less technically literate and adventurous, and reminded us that age need not keep one away from the joys of technology. William, thanks for all your contributions. We'll miss you!" Loughborough lived on a farm near Yakima, Wash.